I am 32 years married and residing with daughter in Bengaluru. I have been investing in ELSS via SIP for the past 2 years. Recently, I have been hearing a lot about liquid funds. I want to invest in these liquid funds, but I am confused. Are these liquid funds safe? ELSS is a type of diversified equity mutual fund which is qualified for tax exemption under section 80C and offers the twin advantage of capital appreciation and tax benefits. It comes with a lock-in period of 3 years. SIP allows you to invest a certain pre-determined amount at a regular interval (weekly, monthly, quarterly, etc.). 1. Liquid funds are the least risky of all mutual funds and invest in short-term bond instruments. These funds are ideal for keeping money that would be needed in a short period of time. 2. These funds are flexible and always provide an exit option to investors. Whenever you would like to get a part or whole of your money back, you can place a redemption request and the money will come to your bank account in a single business day. Factors such as low risk, potential for higher returns, and the quick availability of money make these funds an ideal choice for parking money for a short duration. The vision of Mr. C S Sudheer is to build a nation that is financially literate with investment savvy citizens. A Gold Medalist in economics, Mr. Sudheer started his career with ICICI Prudential Life Insurance and later on moved to Howden India, where he served as the Regional Head. 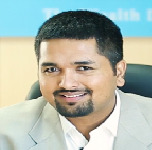 In the year 2008 he founded Suvision Holdings Pvt Ltd. the sole promoter of IndianMoney.com. WealthDoctor helps you with simple tips & solutions which would become your guide to financial wellbeing. That, indeed, is its purpose to offer the ambitious YOU an insight for financial success which will aid you to acquire money, to keep money and to make your money earn more money.